The King and I (1956) is the popular and elaborate musical and story of the tutoring of the stubborn, King of Siam's wives and children by widowed English school teacher Anna Leonowens in 1862. It was based on Margaret Landon's 1944 novel Anna and the King of Siam that was based on Anna's own autobiographical story - considered historically questionable by some sources. Controversy has arisen over the historical accuracy of the film and its depiction of the King, leading to the film's recent banning in Thailand. Richard Rodgers and Oscar Hammerstein II's opulent Best Picture-nominated film (with choreography by Jerome Robbins) was an adaptation of their own 1951 Broadway musical version. An earlier non-musical film Anna and the King of Siam (1946) starred Rex Harrison and Irene Dunne, remade as Anna and the King (1999) with Jodie Foster and Chow Yun-Fat. The Cinemascopic 20th Century Fox film featured the signature roles of both Oscar-winner (and Tony-winner) Yul Brynner (as the bald-headed, bare-foot King Mongkut of Siam) and Oscar-nominated Deborah Kerr (as feminist British tutor Anna Leonowens). It was nominated for nine Academy Awards including Best Picture, Best Director (Walter Lang), Best Actress and Best Color Cinematography (Leon Shamroy), with five Oscars including Best Actor, Best Music Score (Alfred Newman & Ken Darby), Best Color Art Director/Set Decoration, Best Color Costume Design, and Best Sound (Carlton W. Faulkner). 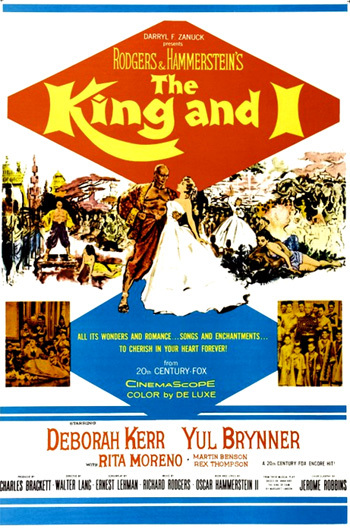 The plot revolves around Welsh widow Anna Leonowens (Deborah Kerr) and her young son traveling to Siam in the early 1860s to teach the young children of the arrogant, headstrong King Mongkut (Yul Brynner), who wishes to learn Western culture (to the dismay of his court advisors). A darker subplot surrounded the affair between Burmese slave Tuptim (Rita Moreno) who seditiously writes a ballet (performed as a "play within a play") based on Harriet Beecher Stowe's novel Uncle Tom's Cabin. The proud, bald King is behind the times (considered a "barbarian" by the English), and his personality - fiercely chauvinistic, arrogant, and unfamiliar with challenges to his supreme rule, conflicts with the progressive and strong will of Anna, who is unafraid of him. The King sums up his relationship with her: "You are very difficult woman." The film is memorable for the timeless Rodgers and Hammerstein music and songs (Kerr's voice was dubbed by Marni Nixon), including the famed scene in which Anna and the King danced energetically and joyously in the memorable number Shall We Dance? Other famous tunes included Getting to Know You (sung with the King's children), Hello, Young Lovers, and I Whistle a Happy Tune. They eventually come to love, admire and respect each other, however. She agrees to stay on to offer help and advice to the new ruler and Crown Prince of Siam (Chulalongkorn) following his death.